Whisky may hail from Scotland and Ireland, but its reach is global. And what better way to learn about the international span of whisky than from The World Atlas of Whisky. 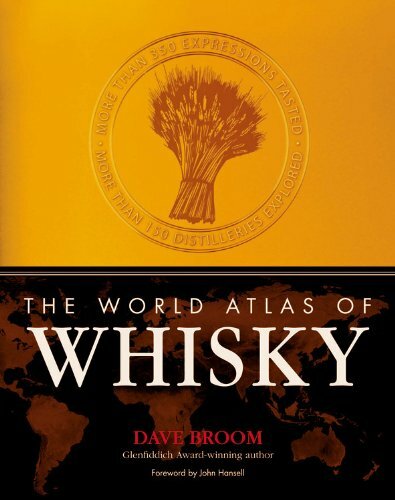 Kind of like your average atlas, only more exciting, and about 100% more interesting, this atlas includes pictures, maps and extensive details about the whisky globe. From the bonny drams of Scotland to the sweltered swigs of India, Dave Broom takes us on an adventure in taste. He begins with the basics, exploring how to use the book as a guide, but also how it is not the final say on all things whisky. That can only be discovered by enjoying the some of the good stuff yourself. “What’s whisky? That’s easy. It’s a spirit that’s been made by mashing a cereal, fermenting it into beer, distilling that and then aging it. That much the world agrees upon – apart from some Indian distillers who make what they call “whisky” from molasses. It might be an extreme example (and you won’t find their whiskies in here) but it does illustrate a fundamental point about this spirit: as soon as you think you have a universally shared principle, exceptions spring up”. And so begins Broom’s exploration of global whisky. He certainly does not limit himself to one reading of the spirit, and this opens his book up to so many global experiences, all of which he fully embraces. As well as the incredible scope allowed by The World Atlas of Whisky, it also presents amazing opportunities for the reader to begin their own experience of international drams. And who wouldn’t want to take a world tour to discover more about their favourite tipple? Please tell me what part of that sounds boring? None of it! Which is exactly why The World Whisky Atlas is the perfect companion to anyone planning such a trip. With maps and featured distilleries from everywhere around the globe you need look no further for the best whisky tourist guide. Even if you aren’t planning to take your whisky enthusiasm beyond your own borders, this book is still a great investment. It opens up whisky and the world that lies behind it, giving you a glimpse beyond the well-known brands, and into the incredible international gems that await you.